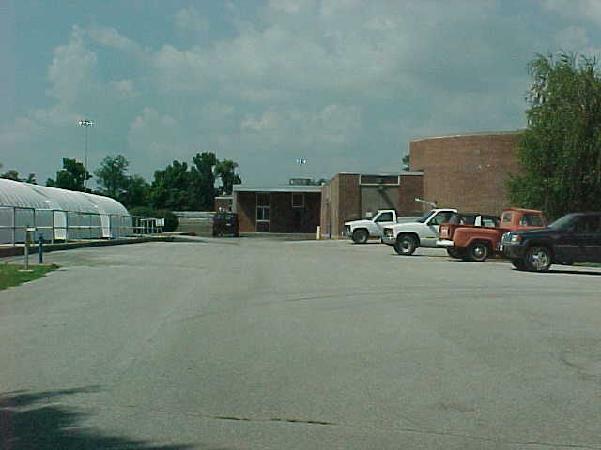 The Hammond-Wood Wastewater Treatment Plant is located on the southwest side of the City of Hopkinsville, directly off Gary Lane and is named after two past board members of the Sewage and Waterworks Commission. The first is Jeff Hammond who served on the board from 1971 thru 1980. The second is Kenneth Wood who served on the board from 1969 thru 1981. This treatment plant serves primairly East, West and South sides of Hopkinsville as well as wastewater that is pumped from the City of Pembroke and parts of Christian County. This plant processes pre-treated industrial and residential wastewater. The plant was originally constructed in 1983. Significant upgrade and expansion in 1995 increased the plants capacity to 6 million gallons per day. In general terms, the plant removes 98.5% of all impurities, and then releases the treated water into the North Fork of The Little River which is located directly behind the plant. The treatment process consists of four stages that include screening, oxidation, settlement and disinfection. The wastewater is first screened to remove solids that are present. The wastewater then flows through oxidation ditches where aerators induce additional oxygen into the water. Natural occurring microorganisms consume the nutrients in this oxygen-enriched wastewater. The wastewater then proceeds to a clarifier where suspended solids are settled out. The effluent from the clarifier is then channeled through ultra-violet rays that kill all living organisms that may be left in the water. The water is then returned to the river. In discussing performance of the plant, the Kentucky Division of Water requires that certain testing be completed on a daily and monthly basis in order to determine the quality of the water that is released into the North Fork. The plant does not exceed the effluent parameters and has won numerous awards for its operational achievements. Please note that the Hammond-Wood WWTP is closed to the public except by appointment. DIRECTIONS: From downtown Hopkinsville, take Ky Hwy 107 South. After crossing Country Club Lane, go south 3 miles to Gary Lane. Turn right on Gary Lane and go 0.2 of a mile to the plant entrance on your right.